The Oregon State Parks Department announced today, August 29, that the fire ban in place for most of the summer has been lifted for Cannon Beach and other North Oregon beaches and parks. For Labor Day visitors to Cannon Beach, that’s great news just in time for the three day weekend. It’s time to break out sweatshirts, beach blankets and makings for S’Mores. The weekend forecast calls for mostly sunny days, but evening temperatures are expected to drop to a brisk mid 50 degrees. Perfect for a beach bonfire! Tolovana Inn has a special S’Mores‘ package for four including roasting sticks, chocolate, marshmallows and graham crackers. You can also get firewood from Tolovana Inn. Just call ahead to reserve your supplies–800-333-8890. 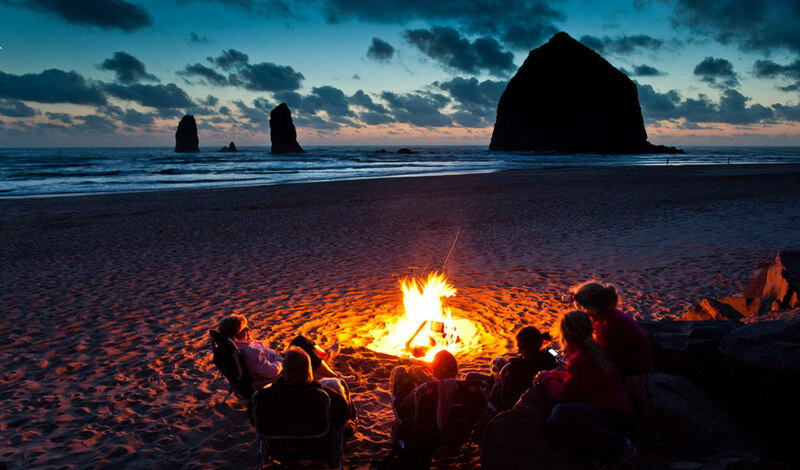 A cozy beach fire is a perfect wind down for what many people consider the final weekend of summer vacation, especially for those whose lives revolve around school calendars. For others, the months of September and October are typically inviting too, for bundling up around an outdoor fire. *Two exceptions are Alfred Loeb and Saddle Mountain Parks, where the fire ban remains.